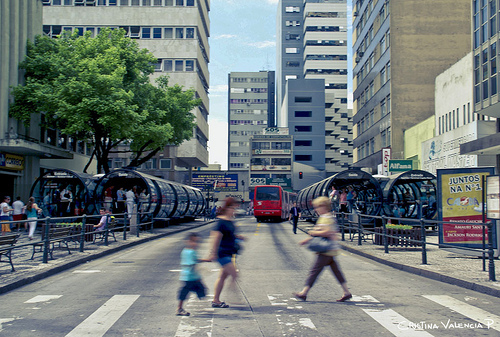 Although SIBRT is currently headquartered in Curitiba, Brazil, it hopes to provide useful data and best practices for cities in other regions of the world looking to implement or improve bus rapid transit systems. Photo by Cristina Valencia. Latin America has some of the most touted transit systems in the world, but it also has some poorly run and maintained transport systems. Since the 1970s, ever since the concept of BRT was born in Curitiba, Brazil, these systems have been running inconsistently and independently from each other, without a common set of standards, references or guidelines. Because of the disparity in the performance of bus systems in the region, a new industry coalition was established, called the Latin American Association for Integrated Transport Systems and Bus Rapid Transit, or Asociación Latinoaméricana de Sistemas Integrados de Transporte y BRT (SIBRT), for which EMBARQ (the producer of this blog) serves as technical and administrative secretariat. SIBRT, launched in April last year, includes 14 of the most influential transit agencies in Latin America, representing five countries: Colombia, Brazil, Chile, Mexico and Ecuador. (For the full list of members, go here.) Combined, the agencies serve about 19 million riders per day. The group aims to prioritize mass transit in Latin America cities by developing standard methodologies to measure the performance, impact and management of BRT systems, synchronizing data collection across transit agencies, and creating safety baseline measurements. By sharing a common set of standards, case studies and best practices, SIBRT aims to help improve transit systems across Latin America, dealing with challenges like overcrowding and fare evasion, the encroachment of bus lanes by general traffic, or slow bus speeds. Members of SIBRT hope to spur innovation, foster an efficient and reliable transit industry, and, ultimately, demonstrate how BRT and integrated transit systems can help improve public health, safety, quality of life and economic competitiveness in Latin American cities. “Building a collaborative network that analyzes the effectiveness of bus systems and influences transport policy is important for the evolution of bus systems in Latin American cities and the rest of the world,” says EMBARQ’s Latin America Director Luis Gutierrez, who was nominated as the association’s first honorary member. EMBARQ, under Gutierrez’s leadership, had the vision that brought these agencies together across languages and cultures—never before done in Latin America’s transit sector. Experts from the EMBARQ Network, including the Centers for Sustainable Transport in Mexico, Brazil and the Andes, will work closely with the agencies to measure performance, impact, and management of the transportation systems in each city, as well as to plan and implement future transportation projects. They will provide guidance in four specific areas: 1) benchmarking and innovation, 2) negotiations with suppliers, 3) commercial, financial and political decision-making, and 4) communications and branding. The existence of an association will allow highly successful transit agencies to share their experiences, best practice and data. Launched in Bogota, Colombia in 2000, Transmilenio, for example, set a new standard for BRT worldwide, in part, through its use of a double, exclusive busway, in which buses run at a rate of 28 kilometers per hour. These types of lanes are now regarded as a worldwide standard. SIBRT will help promote and standardize other elements of high-quality BRT systems, including Intelligent Transportation Systems (ITS), like real-time bus tracking or bus prioritization at traffic lights; exclusive bus corridors; level platforms between the bus and curb; pre-payments; and controlled access to stations. “Solid implementation of BRT means utilizing prior knowledge so new systems are implemented smoothly and effectively,” Gutierrez says. SIBRT’s initial work involves the creation of “Key Benchmarking Indicators” (KBIs). No final agreement has been reached, yet, on the measurements or methodologies. As we previously wrote about in TheCityFix, communication is also key to the success of BRT. Overstated benefits undercut the positive perception of such transit systems, especially in the eyes of those policymakers and citizens already critical of transit modes that take away road space from the car. Plus, the mislabeling of systems that don’t have all the elements of BRT, such as a this bus corridor in Delhi, India, leads to more misunderstanding. A failing BRT system, locally, is bad for the perception of this type of transit system, globally. One such example is Transantiago, a BRT system that serves Chile’s capital, that initially failed on a number of fronts, including a lack of user input and “limited legal, institutional or financial support.” Additionally, in retrospect, rather than being rolled out all at once, Transantiago could have benefited from tiered improvements and gradual implementation. Transantiago is now a member of SIBRT and is remodeling its system, in part, by using SIBRT as a forum to discuss its ideas. SIBRT will likely have 15 new members by its Second General Assembly, which will be held for two days during the “Primera SIBRT Expo Guayaquil 2011: Las Mejores Prácticas de Sistemas de Buses de América Latina (First SIBRT Expo Guayaquil 2011: Best Practices of Latin America Bus Systems)” on April 25 to 28. Obviously, there is not a one-size-fits-all solution for BRT, but by building standards for measurement and evaluation, and providing a body of accessible research and expertise, cities will have the tools to develop and build upon the models that exist in Latin America.